This post was inspired by a feature request published on our Nolt board. Since the launch of our Framework and Components library, we’ve welcomed all feedbacks and suggestions on how to improve them. Luca asked if we could integrate a set of visibility classes, similar to what Bootstrap does. These utility classes are used to show/hide elements at specific breakpoints. In this article, I’ll explain the method I’m developing for our framework, based on CSS Variables. The primary goal of the display utility classes is toggling the visibility of an element at specific breakpoints. A classic example is hiding some controls on small devices, then showing them past a breakpoint using media queries. You’d have to do the same for all the breakpoints. Finally, it may be safer to add the !important rule to all the display classes. I’m not pasting the final code here for brevity (it’s a lot of classes! ), but you can check the final result in this gist. This approach is totally fine and super easy to work with. The only downsides are 1) the number of utility classes that power it and 2) the idea of using utility classes at a molecular level in a system, like ours, mostly based on components. When I started working on the display classes for the CodyHouse Framework, my #1 goal was simplifying things. We’ve done the same for all the other parts of the framework (see Typography and Spacing). It was worth spending some time on this as well and see if we could introduce an alternative approach. A system based on classes like the ones in the example above should be smart enough to know which display value apply. Because the value is not defined in the class, it should be defined on a component level in CSS. And that’s fine because our framework is not based on utility classes but components. Let’s start populating our _visibility.scss file! This tweak has a significant impact! We’ve defined a fallback value for the display value (= block), then we can update this value on a component level by updating the variable itself. The last thing to do is replacing the block value of the utility classes with the --display CSS variable. Here we go! A total of 57 lines vs the 249 lines of the previous approach, and more flexibility IMO! 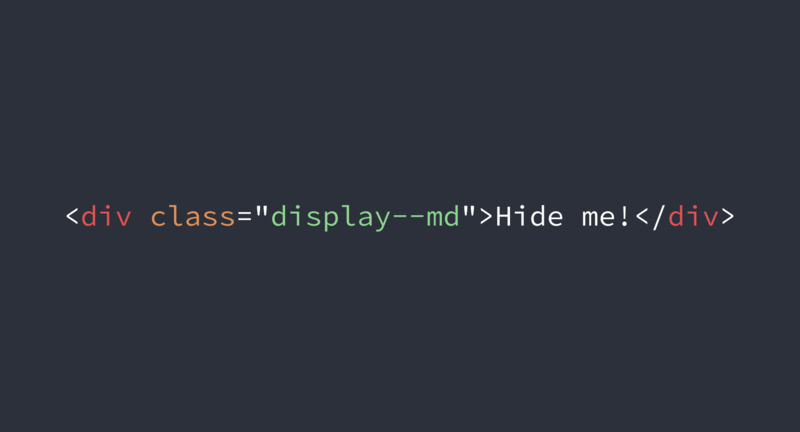 You’re not limited to a subset of display values: you can enter whatever value you want on a component level, and it will be propagated to the display utility classes 🙌. ⚠️ You won’t need the mixin if the display value is block because the default value of the variable is block. This method also opens new possibilities. Think, for example, about the .is-visible and .is-hidden classes we’ve all used so often! These utility classes come with the same dilemma. What should be the display value of .is-visible? Should I create a different class for each display value? Not anymore! We’re still in the process of testing this approach. Because we use the postcss-css-variables plugin, this method is supported in all modern browsers. In the browsers that don’s support CSS Variables, however, the variable won’t be updated on a component level (the plugin cannot do that), therefore the value of the --display variable will always be block. It’s a limitation, but the content remains accessible in all browsers. If you’ve enjoyed this article, you should definitely take a look at our Framework and Library of Components!